The boat fender is a protectional body, which prevents scratching or damage from occurring on the hull or outer shell of a ship while maneuvering through the marina, during mooring against sheet piling or during boat to boat contact. Whether long or round; red, blue, white, or even green or yellow – boat fenders are, no matter on which boat, normally found on board as part of the essentials of boating equipment. One might assume that choosing a boat fender would be an easy affair – far from it! Over and over, we receive calls from our customers, who are not sure which fenders are suitable regarding their specific circumstances, as well as which equipment is additionally required. In this short fender guide, we will try to answer all of the basic questions surrounding inflatable boat protectors, as well as give the reader a few helpful tips along the way. 2, 4, or 6? How many fenders should I have on board? You can never have enough fenders on board. But as space is limited on any boat, the question becomes more critical - do I have the right number of fenders on board? For boats up to 10 meters in length, a general rule of thumb is to have two fenders for each side, with one or two replacement fenders at your disposal. On boats over 10 meters, you will be best served by having 3-4 fenders per side, with one or two replacement fenders as well. 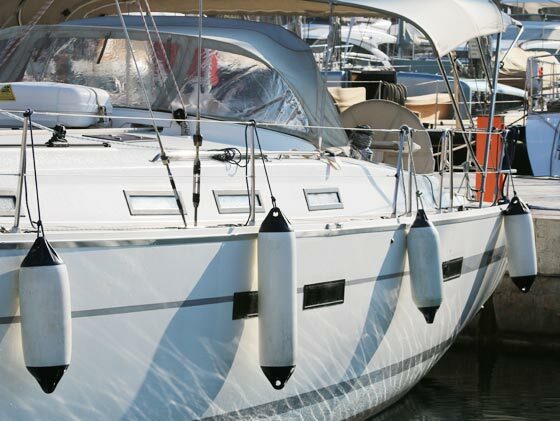 The side fenders should be in place for docking, but you may find yourself needing the spare fenders to help offset a rolling swell or strong breeze pinning you to the dock or sea wall. Here too, having more than one shape or type of fender will come in handy during many situations. Whether round or slim and trim – the various types and shapes of fenders. As previously described, the issue of limited storage space on one hand, and the high need for protection on the other hand, creates a tough compromise regarding your choice of fenders. This issue can however, be mitigated through the proper selection of fenders. The standard types of fenders are the typical ball and long fenders. You should pay close attention to the fact that you should buy fenders, which are the same size and design because you need to distribute pressure equally amongst your fenders, as mixing sizes can place unequal pressure on your equipment. The size of the fenders should be based primarily on the length and weight of the boat, as well as the height of the hull above water. The greater the size of the boat, the more affect wind and waves will have against its hull, meaning more protection will need to be given to the hull. A high freeboard can call for a much larger fender than a boat of similar weight and length, but with a low freeboard. Which boat fender suits me and my ship? Which fender is the most suitable for my vessel's point-of-contact? The long fender or sometimes referred to as a “Walking Fender”, is the most common type of fender. The primary reason for its popularity is its ease of handling and the ability to deploy it either vertically or horizontally, from cleats, railings or lifelines - depending on the size of the vessel. SVB offers a wide selection of both the two eyed long and the centre cored long fender types, depending on your individual needs or preferences. The most common reason for choosing the centre cord long fender is its ability to be used during frequent docking situations, where more roll is needed, in order to bring the boat up alongside the dock. Both types of long fenders offer two attachment points for horizontal placement when needed. The ball fender is, as the name suggests, spherically shaped, which like the long fender is inflated with air and constructed out of tough PVC material with a strongly reinforced single eyelet. The ball fender has excellent point of impact protection and like the centre cored long fender, easily rolls to move the point of contact along with the hull. Ball fenders are often used while manoeuvring through tight spaces or while going in and out of locks. They are often called "Standby Fenders.” They are also very versatile and can be used to mark an anchor location or to float a temporary pick-up line. 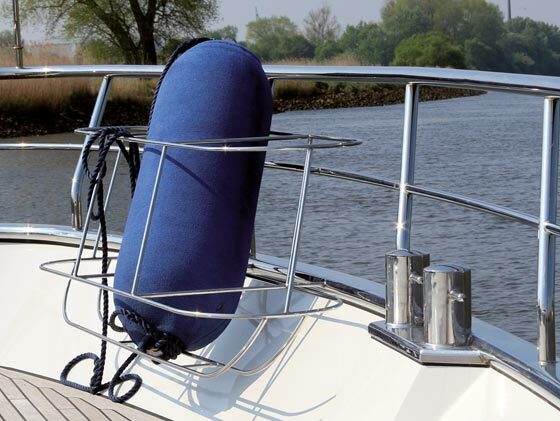 We recommend the quality long and ball fenders from Seatec. Seatec fenders are manufactured here in Europe and are subjected to very high quality controls, while still being offered at excellent prices. We are even able to offer these products in a wide range of colors and sizes as well. Cushion and flat fenders are great additions to any vessel’s equipment! The big advantage of this type of fender is its excellent storability, the low possibility of slippage and the variety of applications that it can be used in. Cushion fenders are made out of foam and depending on the model, can also be fitted with nylon coating. Cushion fenders are often used on locks, cranes and slipways. The only disadvantage that they have compared to a traditional PVC fender is their lightness, which while berthing in strong winds, might cause them to fly away. In addition, the cushion fender is not as durable as the traditional PVC fender. 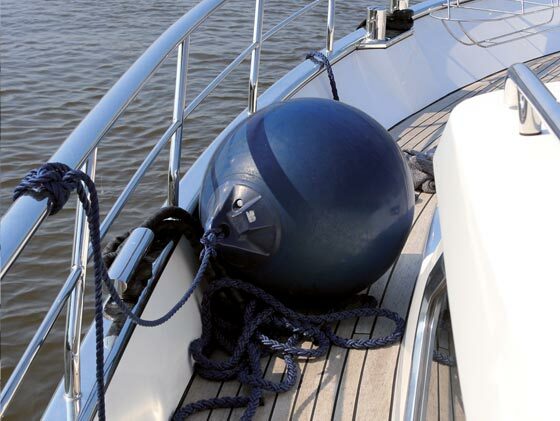 Tip: In strong winds it helps to apply a water saturated sheet on your cushion fender to keep it pulled down in to place, thus helping to maintain protection for your vessel. SeaEQ offers a new, more colorful version of flat fenders. 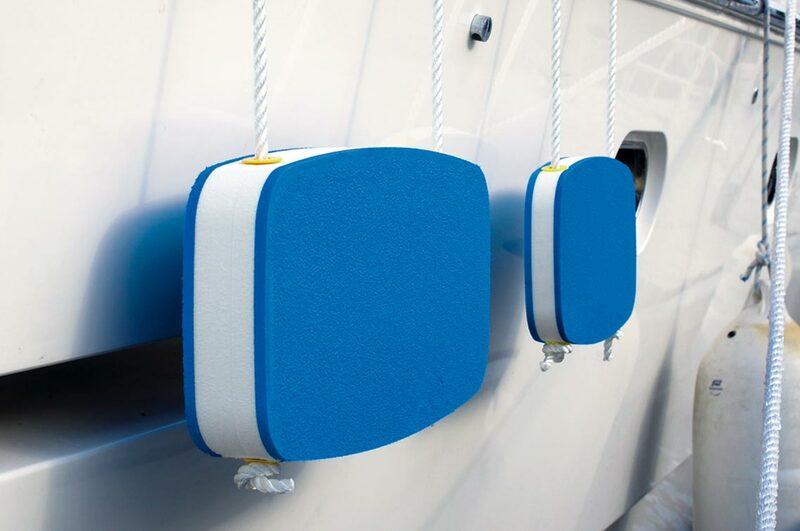 The flat fenders from seaEQ are very long and offer a large area of protection for your boat. Especially when you do not have much space available while manoeuvring in to the box, seaEQ provides a helpful remedy. 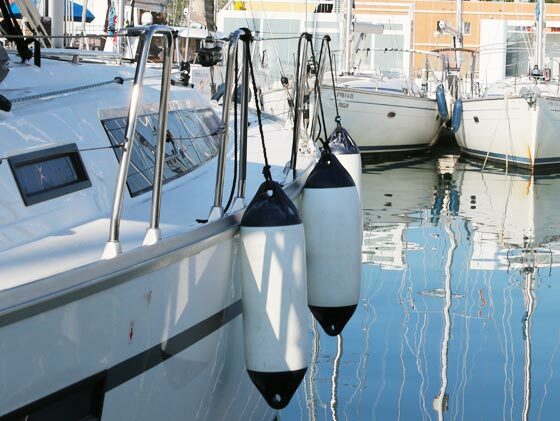 Pole fenders, often called pile fenders are ideal to have on board while wanting to save space. Of course, you should always have a large amount of fenders on board for your own safety, but you can save yourself a lot of hassle by tactically using pole fenders in situations where it would take much more time and effort to use a traditional fender. Rolling dock fenders exist in many different versions, for example, as a rolling, round fender that rolls in unison with the ship’s movement. In addition to usual long fenders and ball fenders, there are several other useful fender types, such as fenders that can be used as steps or ladders. Make some room! – Where do I store my fenders? A quick look in the back storage container of most ships will paint a similar picture: boat fenders generally take up the most storage space and they are rather impractical when it comes to storing them. Nevertheless, safety on board remains a top priority, and should not be given up for a lack of space. Too few fenders on board can be just as bad as having none at all! But then where should I store them? The deck and railing lend themselves as a perfect place here. In our large selection, you can find fender baskets made out of sturdy stainless steel, which can easily be mounted on to the bars of boat railings. 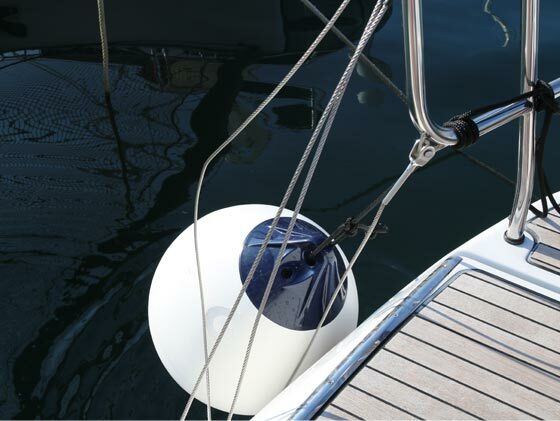 With many types of fender holders, you can mount your fenders to the stern of your vessel, where they will interfere with your space the least. When your fenders have to be kept off of the deck, you are left with two possibilities to store them – either in the back storage container or in the cabin. Air and Pressure – What do I have to pay attention to? Inflatable long and ball fenders are delivered to us deflated. Therefore, the fenders must be inflated with your own hands. How do I pump up a fender? For inflating Polyform brand fenders, SVB offers customers a special air pump. This pump does not work with SEATEC fenders. For inflating SEATEC fenders, we recommend having them inflated at either a gas station or harbour, which has a compressor on site. How much air pressure does my particular fender require? Long and ball fenders require low internal pressure, due to their volume. Their recommended pressure is generally between 0.15 and 0.2 bars; however this depends on the circumference and size of the fender. By comparison, the tires of our SEATEC board bicycles should be inflated to approx. 2.5-3 bars. Warning: insufficient pressure in the fender lessens the ability of the fender to provide sufficient protection, while too much pressure will take away from the cushioning effect of the fender. In general, long fenders should not bulge out laterally while being pumped up, and you should be able to press in to the fender without total resistance. It is recommended that you test fenders for their correct pressure. Moderate pressure loss is normal, and you must occasionally reinflate your fenders. Very rarely, a fender can burst, but in such a situation, you should be prepared: the valve of a burst fender can act like a bullet! Therefore, the SVB fender specialists recommend hanging your fenders with their valves facing downwards. So, in case one does burst – the valve will be shot down in to the water and not towards anyone on deck. How and where do I attach my fenders? This is a critical question, as the placement of your fenders will determine how effectively your boat will be protected. Normally, the fenders will be attached to the railings and handrails, or they will be clamped down. Of course, fenders should be hung anywhere that there is a possibility of scratching or damage to occur. In most cases, fenders will be situated on top of the railing. If your fenders will be exposed to heavy forces or loads, we recommend that you secure the fenders with a clamp, a winch or a foot rail. The positioning of the fender is also critical because if it is wrongly placed, it can rub against the gelcoat and cause abrasions and damage. This applies to fenders, which have been hung either too high or too long on the hull. In these cases, the fender also does not offer optimum protection. So always try and find the perfect spot! TIP: We recommend using a single line spliced into each fender. This allows for individual placement and height adjustments to position your fenders into the perfect spots. BIG TIP: In many German ports it is not uncommon for boats to “raft off” the first boat at dockside. So to prevent the initial shock of discovering damage from another vessel, which had too few or improperly hung fenders, we recommend that you place fenders on to the open side of your boat while docked as well. We recommend that you tie on your fenders using a clove hitch with a slip knot. 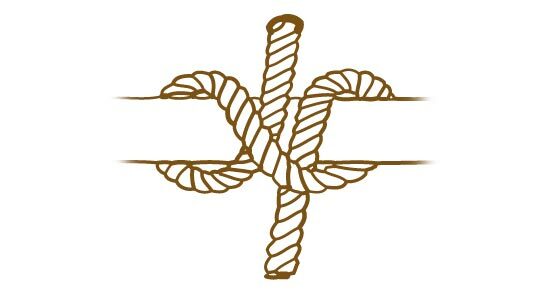 This is the most widely used knot in Germany and it is taught as a part of all boating licence examinations in Germany. However, there are still some differentiating opinions in Germany among sailors concerning whether the clove hitch with slip knot, opposed to just the simple clove hitch is better for tying on fenders. As fenders are deployed quite frequently, the addition of using slip knots will speed up these processes, especially if your vessel is outfitted with multiple fenders. The main argument supporting the use of the simple clove hitch is that it is a more durable knot, which will remain in place even under great stress or loads. One other commonly used method is the use of a clove hitch along with two other half hitches for longer deployments and improved protection against the chaffing of fender lines. We won’t try to resolve these differentiating schools of thought here, but we do carry a selection of fender hooks, which can also be used to make the process of fender deployment much quicker and easier! The color of my fenders – is it really important? SVB offers customers a variety of boat fenders in many different colors. Of course the selection of fender colors is mainly an issue of personal preference, but they also fulfil other purposes. For example, if you use your fender as a buoy for an anchor, a specialty color can distinguish it from others around it. Generally, the lighter the color of the fender, the more bound it is to getting dirty, while dark fenders pair together very nicely with dark colored hulls. While deciding which color of fender you would like, you could also leave it up to your personal tastes and preference. How do I clean my fenders? After the season is over, you really notice the punishment that you put your fenders through! Whether yours are marked up with abrasions caused by contact against rusty sheet piling or a dirty neighboring yacht, your fenders will need thorough cleaning. That means - don’t wait until the winter is over to clean your fenders. Instead, maintain the cleanliness of your fenders during the boating season or before you put it in to storage for the winter. It is important to note that we offer a wide range of cleaning products directed towards the upkeep of your fenders. It is necessary to only work with these products while wearing gloves. You should avoid all hand and eye contact with these products. In order to clean very dirty fenders, we recommend using water and soap initially before using a cleaning solution. Fender lines are usually purchased separately from the fenders themselves. We offer a broad range of products from the brands: Gleistein, and also Liros in many different colors. The proven fender board is a supplement for fenders, which should not be left out on board if you frequently tie up against sheet piling. 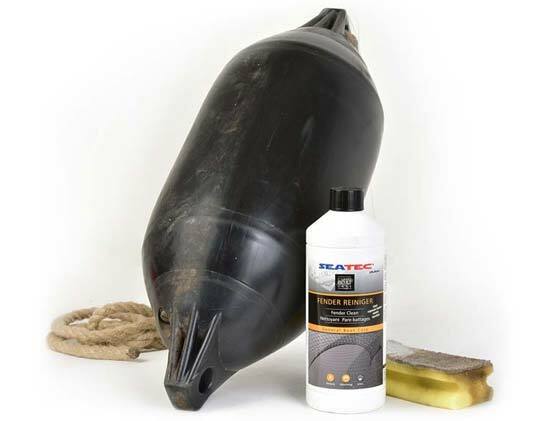 It prevents fender slippage and protects your hull from unwanted collisions with sheet piling. The fender board ensures that pole fenders and conventional fender pairs will provide optimal protection together. At the same time, it can also be used as gangway replacement.